I first became interested in alpine plants in the spring of 1979 while hiking in the north cascades, seeing first hand some of our native alpines in glorious bloom. I had just moved to the Pacific Northwest from an apartment in Washington, D.C. A few house plants were my only previous horticultural experience. 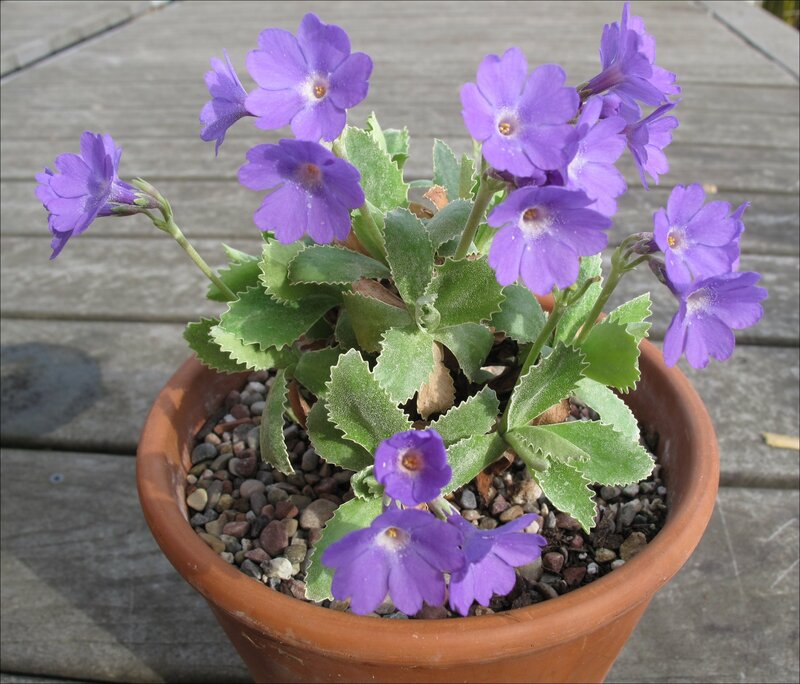 Soon after moving I joined some local plant the groups, the northwest chapter of the North American Rock Garden Society (NARGS) and the local chapter of the American Primrose society. It was at one group meeting where I must have first heard about Herb Dickson’s enormous collection of Lewisias and Primula about 85 miles south of Seattle at his Chehalis Rare Plant Nursery. A few years later that I found some time to make the trip down to Chehalis. Herb was recently widowed, living alone, but graciously invited me into his home and showed me around the nursery. I left with a few plants, mostly Lewisias. 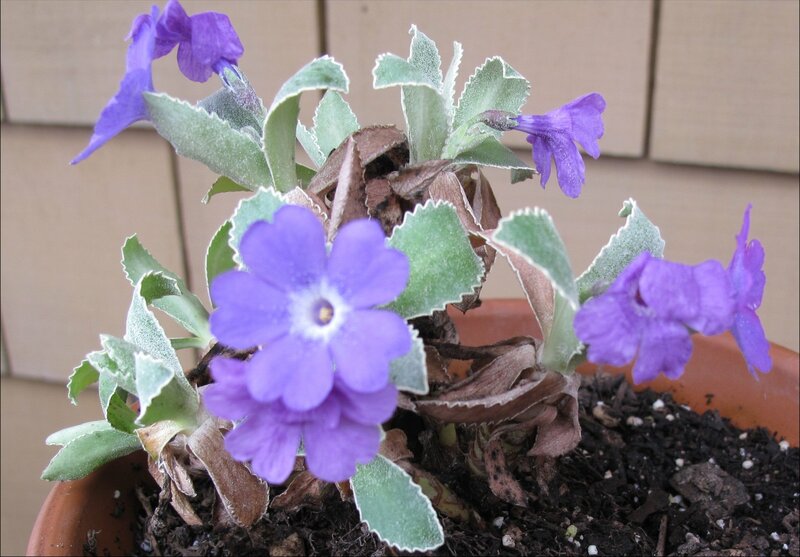 I don’t recall leaving with any plant bearing Herb’s name — and certainly not a Primula marginata. Last spring, more than 30 years later, I stumbled on the cultivar bearing his name while browsing the online catalog of the Sequim Rare Plants nursery. The plant pictured above surprised me by blooming early this January. It was mistakenly left outside in its pot (rather than under cover from excessive wet) most of October, November and December — months which were very wet and mild. The plant was apparently fooled into thinking spring was at hand. When I discovered it blooming I immediately provided shelter from the wet conditions. Overnight temperatures dropped in mid January, so some of the leaves are still quite messy from the cold and wet, but the blooms continue. For more info on P. marginata history and culture see this post. The same plant, with healthier looking leaves and still blooming, more than two months later. 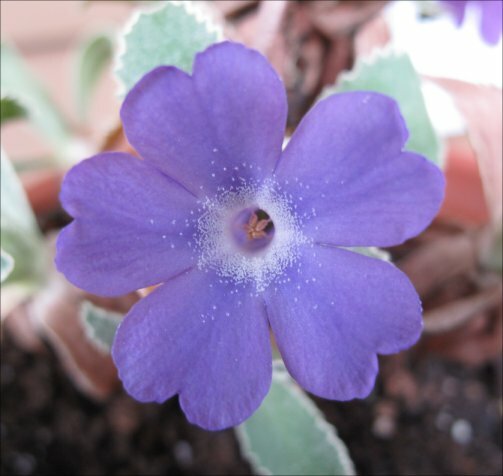 This entry was posted in Alpines and tagged Herb Dickson, NARGS, Primula, Primula marginata, Primula marginata Herb Dickson by Bart Arenson. Bookmark the permalink. Hi there! My name is Heathir McKee and I am Herb Dickson’s Granddaughter. These are so beautiful, I rarely see Auriculas anymore. So beautiful!!! I worked with him at his nursery from 1984 to 1988.